Several studies have shown that organ size, and the proliferation of tumor metastases, may be regulated by negative feedback loops in which autocrine secreted factors called chalones inhibit proliferation. However, very little is known about chalones, and how cells sense them. We previously identified two secreted proteins, AprA and CfaD, which act as chalones in Dictyostelium. Cells lacking AprA or CfaD proliferate faster than wild-type cells, and adding recombinant AprA or CfaD to cells slows their proliferation. 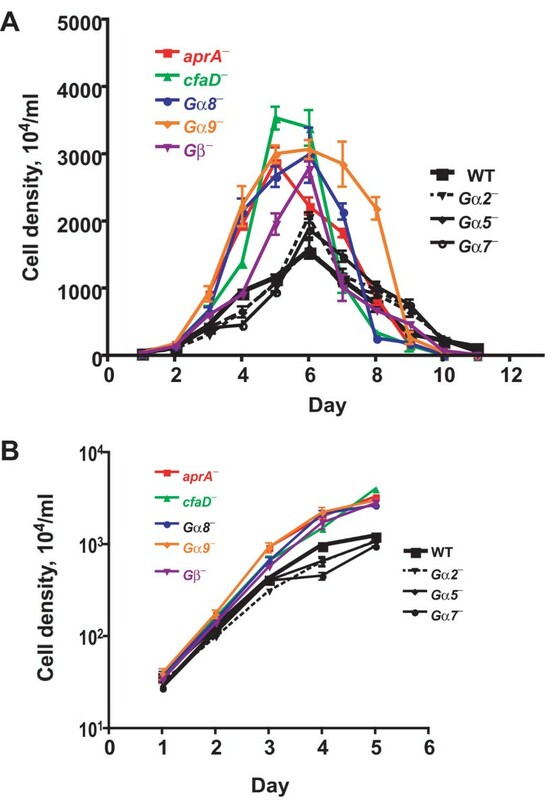 We show here that cells lacking the G protein components Galpha8, Galpha9, and Gbeta proliferate faster than wild-type cells despite secreting normal or high levels of AprA and CfaD. Compared with wild-type cells, the proliferation of galpha8 - , galpha9 - and gbeta - cells are only weakly inhibited by recombinant AprA (rAprA). Like AprA and CfaD, Galpha8 and Gbeta inhibit cell proliferation but not cell growth (the rate of increase in mass and protein per nucleus), whereas Galpha9 inhibits both proliferation and growth. galpha8 - cells show normal cell-surface binding of rAprA, whereas galpha9 - and gbeta - cells have fewer cell-surface rAprA binding sites, suggesting that Galpha9 and Gbeta regulate the synthesis or processing of the AprA receptor. Like other ligands that activate G proteins, rAprA induces the binding of [3H]GTP to membranes, and GTPgammaS inhibits the binding of rAprA to membranes. Both AprA-induced [3H]GTP binding and the GTPgammaS inhibition of rAprA binding require Galpha8 and Gbeta but not Galpha9. Like aprA - cells, galpha8 - cells have reduced spore viability. This study shows that Galpha8 and Gbeta are part of the signal transduction pathway used by AprA to inhibit proliferation but not growth in Dictyostelium, whereas Galpha9 is part of a differealnt pathway that regulates both proliferation and growth, and that a chalone signal transduction pathway uses G proteins. Many tissues or organs have an inherent property of growing to a particular size . In some cases, it appears that size regulation is mediated by secreted factors called chalones, which, as part of a negative feedback loop, repress the proliferation of the cells that secrete the chalones, so that when there is a high number or density of the cells, the corresponding high concentration of the chalone slows proliferation [2–4]. For instance, myostatin, a member of the TGFβ superfamily, is secreted by muscle cells and negatively regulates myoblast proliferation, and thus controls muscle size in a body . Interestingly, many primary tumors appear to secrete factors that repress the proliferation of the metastatic cells, but the factors are unknown [6, 7]. Although some chalones have been identified, much remains to be understood about their signal transduction pathways. Dictyostelium is a unicellular eukaryote and an excellent model system to study the regulation of proliferation and growth. We previously identified two proteins secreted by Dictyostelium, AprA and CfaD, which appear to act like chalones. Cells lacking AprA or CfaD have an abnormally high proliferation rate, and as a result when cells reach a high cell density they have less mass and protein per nucleus [3, 4]. When starved, aprA - and cfaD - cells form spores that have poor viability compared with wild-type spores, or if cultures are maintained after cells reach saturation, the cells then die relatively quickly [3, 4]. This suggests that Dictyostelium cells use chalones to slow proliferation at high cell density (when they are probably about to overgrow their food supply and starve) so that the cells will have more nutrient reserves. Overexpression of either AprA or CfaD, or adding either recombinant AprA (rAprA) or recombinant CfaD (rCfaD) to cultures, slows cell proliferation [3, 8]. Dictyostelium cells have saturable cell-surface high-affinity binding sites for AprA, suggesting the presence of an AprA signal transduction pathway . A common type of signal transduction pathway in eukaryotes involves G proteins [9, 10]. Upon activation, G protein-coupled receptors induce the Gα subunit of the heterotrimeric G protein complex to release GDP and bind GTP, and induce dissociation of the G protein complex to generate active α and βγ subunits. These further activate other downstream effectors to trigger intracellular processes . Binding of GTP to the plasma membrane is thus increased in the presence of ligand, and this has been observed for the G protein coupled cAMP receptors in Dictyostelium . Conversely, treating membranes with GTPγS, a non-hydrolyzable GTP analog generally reduces affinity of the receptors for the ligand, and this has also been observed for the cAMP receptor in Dictyostelium . The Dictyostelium genome appears to encode 12 Gα, 2 Gβ, and 1 Gγ subunits , and 55 G-protein-coupled receptors . Of the 12 Gα subunits, 8 have been characterized, and all characterized Gα subunits and the single characterized Gβ are expressed in vegetative cells, with the possible exception of Gα5 . In this study we investigated whether AprA uses a G protein mediated signaling to repress proliferation. We found that the proliferation of gα8 -, gα9 -, and gβ - cells was faster than wild-type cells, and compared with wild-type their proliferation was only weakly inhibited by rAprA. Cells lacking Gα9 and Gβ have a reduced number of cell-surface rAprA binding sites, suggesting that Gα9 and Gβ regulate the availability or processing of the AprA receptor. rAprA induces GTP binding to membranes, and this process requires Gα8 and Gβ. In addition, GTPγS inhibits the binding of AprA to membranes, and this also requires Gα8 and Gβ. These data suggest a key role of Gα8 and Gβ in the AprA signaling pathway that regulates proliferation in Dictyostelium. Wild-type Ax2, aprA - strain DB60T3–8 , cfaD - strain DB27C-1 , crlA - strain JH557 , gα1 - strain DBS02306088 (the DBS numbers are the Dictybase strain identifiers) , gα2 - strain DBS0236094 , gα3 - strain DBS0235986 , gα4 - strain DBS0235984 , gα5 - strain DBS0236451 , gα7 - strain DBS0236106 , gα8 - strain DBS0236107 , gα9 - strain DBS0236109 , and gβ - strain DBS0236531  cells were grown in shaking culture as previously described . The different transformant strains were produced in different labs at different times, and have different wild-type backgrounds. However, we have examined the proliferation rate of a large variety of different 'wild type' strains, including different sources of Ax2, Ax3, and Ax4, and we found that all of them have similar proliferation rates and sensitivities to rAprA (data not shown). Proliferation assays were done following [4, 26]. Measurements of cell mass and protein, and counts of nuclei were done following  using cells harvested at 5 × 106/ml with the exception that for nuclei counts, cells were fixed with 4% paraformaldehyde (Sigma Aldrich, St Louis, MO, USA) in PBS for 45 min and were then washed with PBS/0.1% Tween-20 for 15 min before staining with DAPI. Spore viability assays were done following . His/Myc tagged rAprA was expressed and purified as described in . Quantification of rAprA and the effect of exogenous rAprA on proliferation were done following . To measure the amount of extracellular AprA and CfaD, conditioned growth medium was collected from cells at a density of 5 × 106 cells/ml following . SDS-polyacrylamide gels of aliquots of the conditioned growth medium were silver stained to check for the amount of proteins in the samples. For the proliferation inhibition assays, cells were grown to 2 × 106cells/ml, and resuspended in HL5 media to 5 × 105 cells/ml. We then added rAprA to 300 ng/ml, or an equal volume of buffer, and after 12 h cells were counted. Proliferation inhibition was defined as the percent decrease in cell density caused by rAprA compared with buffer control. Binding of rAprA to cells was carried out following , where cells were incubated with different concentrations of rAprA at 4°C on an end-to-end tumbler for 10 min. To determine the effect of GTPγS on the binding of rAprA to membranes, cells were washed twice with ice-cold HL5 and resuspended to 5.0 × 106 cells in 485 μl of ice-cold HL5. Either 5 μl of PBM (20 mM KH2PO4, 0.01 mM CaCl2, 1 mM MgCl2, pH 6.1 with KOH) or 5 μl of 10 mM GTPγS (Sigma) in PBM was added to cells. The cells were then lysed by passing the cell suspension through a Cameo 17N 5 μm pore size syringe filter (GE Osmonics, Minnetonka, MN, USA) into ice-chilled Eppendorf tubes containing 150 ng of rAprA in 10 μl of ice-cold HL5. The tubes were mixed on an end-to-end rotor at 4°C. After 10 min, the crude membranes were collected by centrifugation at 17,000 × g for 10 min at 4°C. The pellet of membranes was gently washed (without resuspending the pellet) with 500 μl of ice-cold HL5 and the pellet was collected by centrifugation at 17,000 × g for 1 min at 4°C. The supernatant was removed and the membranes were resuspended in 50 μl of SDS sample buffer and heated at 95°C for 5 min. The amount of rAprA bound to the membranes was analyzed following , loading 5 μl of sample per lane. Binding of 5.1 Ci/mmol [3H]GTP (GE Healthcare, UK) to membranes was measured following  with the following modification. Eppendorf tubes containing 100 μl of binding reaction (500 nM [3H]GTP, 5 mM ATP, 25 mM MgCl2 in ice-cold PBM) with or without 60 ng of rAprA were chilled on ice. To exclude non-specific binding, duplicate tubes additionally contained 0.1 mM GTP. Cells were collected and washed as described above and were resuspended to 5 × 107 cells in 1 ml of ice-cold PBM. The resuspended cells were then lysed by passing through Cameo 17N 5 μm pore size syringe filters (GE Osmonics). To initiate binding, 100 μl of lysed cells was added to the binding reaction and incubated on ice for 10 min. Membranes were collected by centrifugation at 17,000 × g for 5 min at 4°C. The pellet of membranes was gently washed without resuspending the pellet with 1 ml of ice-cold PBM, and the pellet was collected by centrifugation at 17,000 × g for 1 min at 4°C. The pellet was then dissolved in 100 μl of 1% SDS and mixed with 10 ml of Bio safe II counting cocktail (Research Products International, Mount Prospect, IL, USA). The amount of [3H]GTP was determined using a scintillation counter (Beckman Coulter, Fullerton, CA, USA). The counts from the tubes with 0.1 mM unlabeled GTP were subtracted from the experimental tube counts to obtain the counts for bound [3H]GTP. All statistics were done with Prism (GraphPad software, San Diego, CA, USA). One-way ANOVA using Dunnett's or Tukey's tests were done to compare multiple values, and paired t tests were done to compare paired values. Significance was defined as P < 0.05. We previously found that Dictyostelium cells are able to bind AprA, suggesting that AprA is sensed by a cell surface receptor . Since the Dictyostelium genome encodes many G protein coupled receptors, it is possible that G proteins could be involved in AprA signal transduction. To examine this possibility, we analyzed the effect of rAprA on the proliferation of gβ - cells. When treated with rAprA, the proliferation of wild-type cells was inhibited by ~17% (Figure 1), which is similar to what we have previously observed , whereas the proliferation of gβ - cells was only minimally inhibited. 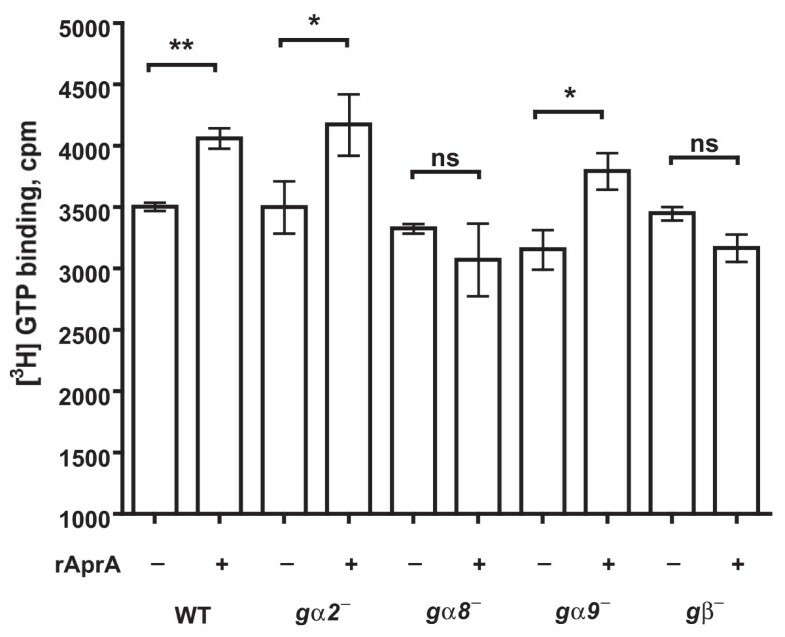 This suggests that AprA signal transduction may be defective in gβ - cells. As with wild-type cells, rAprA inhibited the proliferation of gα1 - , gα2 -, gα3 -, gα5 -, and gα7 - cells but had little effect on the proliferation of gα8 - and gα9 - cells (Figure 1). Although the proliferation of gα4 - cells was partially inhibited by rAprA, the inhibition was significantly higher than that for gα8 -, gα9 -, and gβ - cells (Figure 1). Together, the data suggest that gα8, gα9 and Gβ strongly potentiate AprA signaling. The effect of recombinant AprA (rAprA) on cell proliferation. Cells were grown in the presence or absence of rAprA for 12 h, and the percent decrease in cell density caused by rAprA was calculated. When compared with the inhibition of wild-type (WT) cell proliferation, the inhibition of gα1 - , gα2 -, gα3 -, gα5 -, and gα7 - cells is not significant with P > 0.05 (one-way ANOVA, Dunnett's test), whereas the inhibition of gα4 - is significant with P < 0.01, and the inhibition of gα8 -, gα9 -, and gβ - cells is significant with P < 0.001. 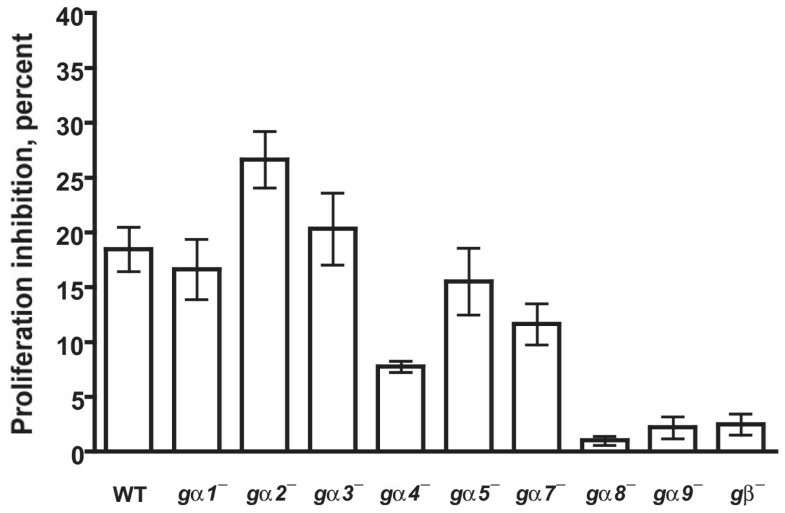 The inhibition values for gα8 -, gα9 -, and gβ - cells are not significantly different between each other with P > 0.05 (one-way ANOVA, Tukey's test), but the inhibition of Gα4 - cells is significantly different from that of gα8 -, gα9 -, and gβ - cells with P < 0.01 (one-way ANOVA, Dunnett's test). Values are the mean ± s.e.m. from at least four separate experiments. Cells lacking AprA proliferate faster than wild-type cells, and exogenous AprA slows proliferation [3, 4]. Cells deficient in AprA signal transduction thus may also have altered proliferation. Proliferation curves were done to determine whether cells lacking G proteins had altered proliferation. We found that wild-type cells proliferated similarly to what we have previously seen  (Figure 2A). The proliferation of gα2 - , gα5 -, and gα7 - cells was similar to the wild-type cells, while gα8 -, gα9 -, and gβ - cells proliferated faster and reached higher cell densities, similar to aprA - and cfaD - cells (Figure 2A). At low cell densities, where the levels of secreted factors such as AprA or CfaD are low [3, 4], all the cell lines have doubling times between 10 and 14 h, with the proliferation of aprA -, cfaD -, gα8 -, gα9 -, and Gβ - cells significantly faster than wild-type (Figure 2A and 2B, and Table 1). At high cell densities, where the levels of AprA and CfaD are high, the doubling time of wild-type cells slowed to ~35 h (Table 1). The doubling times of aprA -, cfaD -, gα8 -, and gα9 - were significantly shorter, with the doubling time of gα8 - cells at high cell density similar to the doubling time of the wild-type cells at low cell density (Figure 2B and Table 1). We previously observed that after cells reached stationary phase and stopped proliferating, aprA - and cfaD - cells died faster than wild-type cells [3, 4]. In the growth curves presented here, we invariably saw that at days 10 and 11 there were still viable wild-type, gα2 - , gα5 - , and gα7 - cells, but the aprA - , cfaD - , and gα8 - cells appeared to be all dead at day 10, and there were few if any live gα9 - and Gβ - cells at day 11. Together, the data suggest that, like AprA and CfaD, Gα8, Gα9, and Gβ slow cell proliferation, and cells lacking these proteins die off faster than wild-type after cells reach stationary phase. Doubling times were calculated using the data from Figure 2. Low density doubling times were calculated for cells in the range of 2 × 105 to 5 × 106 cells/ml. High density doubling times were calculated for cells in the range of 5 × 106 to 2 × 107 cells/ml. All values are means ± SEM's from three or more independent assays. A * indicates a statistically significant difference with p < 0.05; ** indicates p < 0.01, comparing the value to the wild type value (1-way ANOVA, Dunnett's test). Cells lacking Gα8, Gα9 or Gβ proliferate faster than wild-type cells. (A) Cells were diluted to 2 × 105cells/ml in HL5 and the cell density was measured daily. The graph shows means ± s.e.m. from three independent experiments. The differences between the maximum cell density attained by wild-type cells and aprA -, cfaD -, gα8 -, gα9 -, and gβ - mutants are significant with P < 0.05, whereas the difference between the wild-type maximum density and the gα2 -, gα5 -, and gα7 - maximum densities are not significant (one-way ANOVA, Dunnett's test). (B) The data from the first five days was plotted using a log scale for the density. The absence of error bars indicates that the error was smaller than the plot symbol. Cell growth, defined as the rate of increase in mass or protein content per cell (or per nucleus if cells are multinucleate), can be regulated separately from proliferation [28–32]. We previously observed that AprA and CfaD do not affect the mass or protein content of cells [3, 4]. In contrast, compared with wild-type, gα8 - , gα9 - , and gβ - cells had more mass per cell, and gα9 - and gβ - cells had more protein per cell (Table 2). Compared with wild type, aprA - and cfaD - cells tend to be multinucleate [3, 4]. Similarly, gα8 - and gβ - cells also tended to be multinucleate (Table 2). Both aprA - and cfaD - cells have less mass and protein per nucleus [3, 4]. In contrast, we observed that compared with wild-type, gα9 - cells have more mass and protein per nucleus, whereas gα5 - cells have less protein per nucleus (Table 2). Compared with wild-type cells, gα8 - , gα9 - , and gβ - cells had a greater increase in mass and protein per cell per hour, and gα8 - and gβ - cells had a greater increase in nuclei per cell per hour (Table 3). However, when normalized to nuclei, only gα9 - cells had a greater increase in mass or protein per hour. Together, the data indicate that although gα8 - and gβ - cells proliferate faster than wild-type cells, their growth per nucleus is not statistically different from wild-type. Conversely, gα9 - cells have a greater growth per nucleus than wild-type cells. The mass and protein content of cells was measured as described in the Materials and Methods, and the percent of cells with 1, 2, 3, or more nuclei was measured by counts of DAPI-stained cells. After calculating the average number of nuclei per 107 cells, the mass and protein per 107 nuclei was calculated. All values are means ± SEM's from three or more independent assays. A * after a value indicates that the value was significantly different from the wild-type value with p < 0.05; ** indicates p < 0.01(1-way ANOVA, Dunnett's test). The mass, protein, and nuclei number values shown in Table 2 were divided by the observed high density doubling times from Table 1 (the mass, protein, and nuclei numbers were measured in this density range) to obtain the approximate increases in mass, protein, and nuclei per hour. All values are means ± SEM's from three or more independent assays. A ** indicates that the value was significantly different from the wild-type value with p < 0.01 (1-way ANOVA, Dunnett's test). The rapid proliferation of gα8 -, gα9 -, and gβ - cells could be due to low levels of extracellular AprA or CfaD. To check this, we stained Western blots of conditioned growth media for AprA and for CfaD. Silver-stained SDS polyacrylamide gels showed that the protein profile of the conditioned growth media, and approximate amounts of the protein in the different bands, was consistently the same for all strains except for gα2 - , where there appeared to be less protein in all the bands despite the fact that the starting and final density of the cells in the gα2 - cultures was very similar to wild-type (data not shown). Wild-type cells accumulated extracellular AprA to levels (~165 ng/ml) similar to what we previously observed  (Figure 3A and data not shown). The amount of AprA accumulated by gα5 -, gα7 -, gα8 -, gα9 -, and gβ - cells was similar to that of wild-type cells, whereas gα2 - cells had lower (33 ng/ml) levels of AprA (Figure 3A). Wild-type cells accumulated 15 ng/ml of CfaD (Figure 3B and data not shown), again similar to what we previously observed . gα5 -, gα7 -, gα8 -, gα9 -, and gβ - cells accumulated similar or higher levels of CfaD, while gα2 - cells accumulated less (2 ng/ml) CfaD. Together, the data indicate that gα2 - cells accumulate less extracellular protein, including AprA and CfaD, than wild-type cells, and that the rapid proliferation of gα8 -, gα9 -, and gβ - cells is not due to low levels of extracellular AprA or CfaD. The accumulation of extracellular AprA and CfaD. The indicated cell types were grown in HL5 and conditioned growth media were collected. Western blots of the conditioned growth media were stained with anti-AprA antibodies (A) or anti-CfaD antibodies (B). The arrow in A indicates the 60 kDa AprA band, and the arrow in B indicates the 62 kDa CfaD band. The lower molecular mass bands stained in B are breakdown products of CfaD . Data are representative of three independent experiments. We previously observed that wild-type cells show high-affinity saturable binding of rAprA, suggesting that they have an AprA receptor . To determine whether cells that are relatively insensitive to AprA have an observable defect in the ability of rAprA to bind to this receptor, we measured binding of rAprA to cells. Wild-type cells bound rAprA as previously observed (the binding experiments shown here were done in parallel with the experiments presented in ). gα5 - and gα8 - cells also bound rAprA (Figure 4 and Table 4). The K D and number of binding sites (Bmax) for rAprA on gα5 - and gα8 - cells were not significantly different by ANOVA from wild-type cells. gα9 - and gβ - cells had significantly reduced numbers of rAprA binding sites, with K D values that were not significantly different from wild-type (Figure 4 and Table 4). Although the binding data for the gα8 - cells appeared to show a sigmoidal curve, F tests comparing binding with a Hill coefficient of 1 to binding models with a variable Hill coefficient indicated that a model with a Hill coefficient of 1 was preferred for all cell lines except for gα5 - , where a model with a Hill coefficient of 2.9 ± 0.9 (mean ± s.e.m, n = 3) was preferred. In addition, F tests to compare a one-site binding model with a two-site binding model indicated that a one-site binding model was the preferred fit for all cell lines. 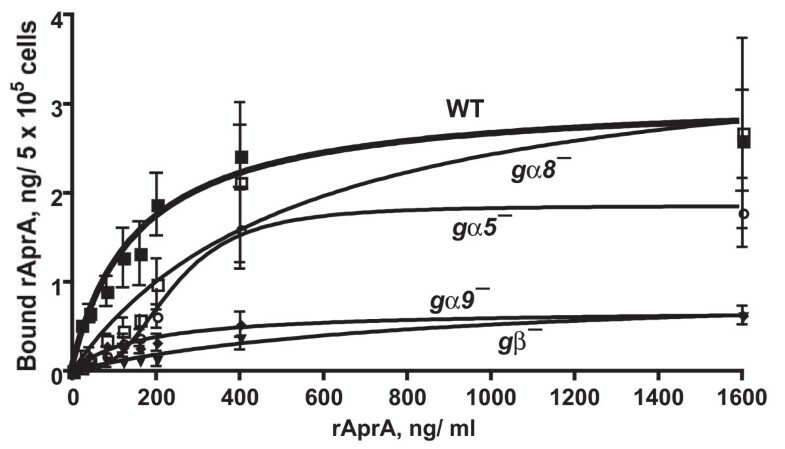 Taken together, the data indicate that cells lacking Gα8 have roughly normal cell-surface rAprA binding, that the lack of Gα5 affects the AprA receptor cooperativity, and that cells lacking Gα9 and Gβ have a reduced number of rAprA binding sites. For the indicated cell lines, the KD in μg/ml and the Bmax in ng/5 × 105 cells was obtained from the curve fits in Fig 4. The KD in nM and Bmax in molecules/cell were calculated using a molecular mass of 60 kDa for rAprA. All values are mean ± SEM, n = 3. A * after a value indicates that the value was significantly different from the wild-type value with p < 0.05 (1-way ANOVA, Dunnett's test). The binding of recombinant AprA to cells. The indicated cells (WT is wild-type) were incubated with different concentration of recombinant AprA (rAprA). After 10 min, bound rAprA was quantitated by Western blots (staining for the Myc tag), using known amounts of rAprA as standards. Values are mean ± s.e.m. (n = 3). The lines are curve fits to a one-site binding model with no cooperative binding with the exception of the fit to the binding to gα5 - cells, where the line is a fit to a one-site binding model with a Hill coefficient of 2.9. GTPγS is a non-hydrolyzable analog of guanosine triphosphate that keeps Ga subunits in the GTP-bound active form . Adding GTPγS to membranes affects ligand binding to G protein-coupled receptors . To determine whether the binding of rAprA is affected when Gα subunits are activated, membranes from vegetative wild-type cells were incubated with rAprA in the presence of GTPγS. Wild-type membranes bound rAprA, and GTPγS caused a ~25% decrease in the binding (Figure 5). To identify which Gα subunit is involved in the AprA signal transduction pathway, similar binding assays were done with membranes from cells lacking Gα2, Gα8, Gα9, or Gβ. GTPγS decreased rAprA binding to membranes from gα2 - and gα9 - cells, whereas GTPγS had no significant effect on rAprA binding to membranes from gα8 - and gβ - cells (Figure 5). In addition, the binding of rAprA to membranes from gβ - cells was strongly reduced when compared with all other cell lines. Together, the data suggest that Gα8 and Gβ are required for the GTPγS-induced decrease in rAprA binding to membranes. The effect of GTPγS on recombinant AprA binding to membranes. Membranes from the indicated strains were incubated with recombinant AprA (rAprA) in the presence or absence of GTPγS. rAprA bound to the membranes was measured as in Figure 4. The presence of GTPγS significantly decreased the binding of rAprA to WT, gα2 - and gα9 - membranes in comparison with the buffer control (*, P < 0.05), while the presence of GTPγS had no significant effect (ns) on the binding of rAprA to gα8 - and gβ - membranes (paired t-tests). Values are mean ± s.e.m. (n = 3). Binding of a ligand to a G protein coupled receptor induces the associated Gα protein to bind GTP . To determine whether AprA induces GTP binding, we incubated cells with [3H]GTP in the presence or absence of rAprA. The addition of rAprA increased the binding of [3H]GTP to membranes from wild-type cells (Figure 6). rAprA also increased the binding of [3H]GTP to gα2 - and gα9 - membranes. 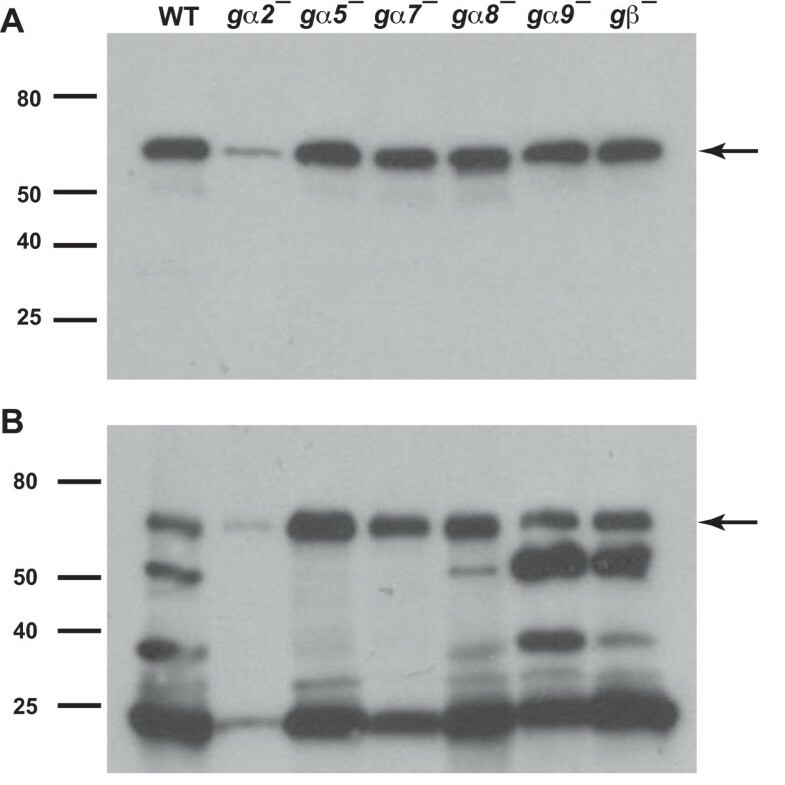 However, rAprA had no significant effect on the binding of [3H]GTP to membranes from gα8 - and gβ - cells (Figure 6). These results indicate that Gα8 and Gβ are required for the AprA-induced binding of GTP to membranes. The effect of recombinant AprA on GTP binding to membranes. The binding of [3H]GTP to membranes in the presence or absence of recombinant AprA (rAprA) was measured following . Wild-type membranes showed significantly increased [3H]GTP binding in the presence of rAprA when compared with [3H]GTP binding in the absence of rAprA with P < 0.01 (**), while gα2 - and gα9 - membranes showed increased [3H]GTP binding with P < 0.05 (*). [3H]GTP binding to gα8 - and gβ - membranes was not significantly different (ns) (paired t-tests). Values are the mean ± s.e.m of at least three independent experiments. We previously observed that aprA - cells, when starved, form fruiting bodies that have an abnormally low number of spores, and these spores have very poor viability . To determine whether gα8 - cells have a similar phenotype, we examined spore production and viability (Table 5). Cells lacking Gβ do not aggregate or form spores . We found that gα8 - cells form roughly normal numbers of spores, but these spores have a significantly reduced viability. This suggests that although both aprA - and gα8 - cells have the advantage of rapid proliferation, they both have the disadvantage of poor spore viability. Cells were counted and then starved on filter pads to generate fruiting bodies. After three days, spores were harvested and counted. Spores were then treated with detergent to kill other cells (stalk cells are already dead), washed, and then diluted and plated with bacteria on agar plates. The number of colonies that appeared was then counted to determine the number of viable detergent-resistant spores. All values are mean ± SEM, n = 3. A * after a value indicates that the value was significantly different from the wild-type value with p < 0.05 (t test). AprA appears to act like a chalone that binds to cell surface receptors and negatively regulates proliferation (the increase in the number of cells per hour) . We found here that, like aprA - cells, gα8 - and gβ - cells proliferate rapidly but have normal growth rates (the increase in the cell mass and protein per nucleus per hour), and that cells lacking Gα8 or Gβ have a low sensitivity to rAprA. Like aprA - and cfaD - cells, gα8 - and gβ - cells die off faster than wild-type after cells reach saturation. Spores tend to be mononucleate, and like aprA - and cfaD - spores, gα8 - spores have poor viability (gβ - cells do not aggregate or form spores). rAprA increases GTP binding to membranes, and this requires Gα8 and Gβ. Conversely, GTPγS inhibits the binding of rAprA to cells, and this also requires Gα8 and Gβ. Together, the data suggest that AprA uses a G protein signaling pathway to slow proliferation but not growth at high cell density, and that Gα8 and Gβ are components of part of this pathway. There are four main classes of Gα subunits, Gs, Gi/o, Gq, and G12 . G protein pathways that regulate proliferation in response to paracrine signals tend to contain Gi/o-type Gα subunits . For instance, the neurotransmitter dopamine inhibits forebrain neural stem cell proliferation by binding to the D2 receptor that couples with a Gi/o protein [35, 36]. The sequence of Gα8 has high identity (40%) to many other Gi/o-like Gα subunits. Gα8 is expressed in vegetative cells and throughout development, and cells lacking Gα8 form fruiting bodies with a roughly normal morphology . Developing aprA - cells have abnormal fruiting bodies and a more severe spore viability defect than gα8 - cells . In addition, aprA - cells have less mass and protein per nucleus than wild-type, whereas gα8 - cells have roughly normal amounts of mass and protein per nucleus, and gα8 - cells have a small residual sensitivity to rAprA. These four differences between aprA - cells and gα8 - cells indicate that Gα8 mediates some but not all of the effects of AprA. Gβ is also expressed in vegetative cells and throughout development, and cells lacking Gβ do not aggregate . Gβ interacts with different Gα subunits to form functional heterotrimeric G protein complexes . Our observation that Gβ is part of the AprA signaling pathway increases the list of different pathways, such as cAMP and folic acid signal transduction, that involve Gβ . Gα9 is expressed during growth and throughout Dictyostelium development . During the aggregation stage of development, Gα9 inhibits chemotaxis [24, 39]. In addition, Gα9 couples to a GABA receptor, GrlE, to regulate spore differentiation during late development . The rapid proliferation of gα9 - cells, and their low sensitivity to rAprA, would at first glance suggest that Gα9 is part of the AprA signal transduction pathway. However, three observations suggest that Gα9 is part of a different signal transduction pathway that regulates the response of cells to AprA. First, unlike AprA, CfaD, Gα8, or Gβ, Gα9 appears to inhibit both proliferation and growth. Second, unlike Gα8, Gα9 is not required for AprA-stimulated GTP binding to membranes. Third, again unlike Gα8, Gα9 is not required for the GTPγS-induced decrease in rAprA binding to membranes. Interestingly, although gα9 - cells have fewer cell-surface rAprA binding sites than wild-type cells, the binding of AprA to membranes from mechanically lysed gα9 - cells is similar to that of wild-type cells, suggesting the possibility that Gα9 regulates the transport of AprA receptors to the plasma membrane. A second gβ-like gene (gpbB, DDB_G0275045) is encoded by the Dictyostelium genome , so Gα9 may possibly interact with this other Gβ to regulate growth. Despite having very low extracellular levels of AprA and CfaD, gα2 - cells have roughly normal proliferation curves, and rAprA slows their proliferation. 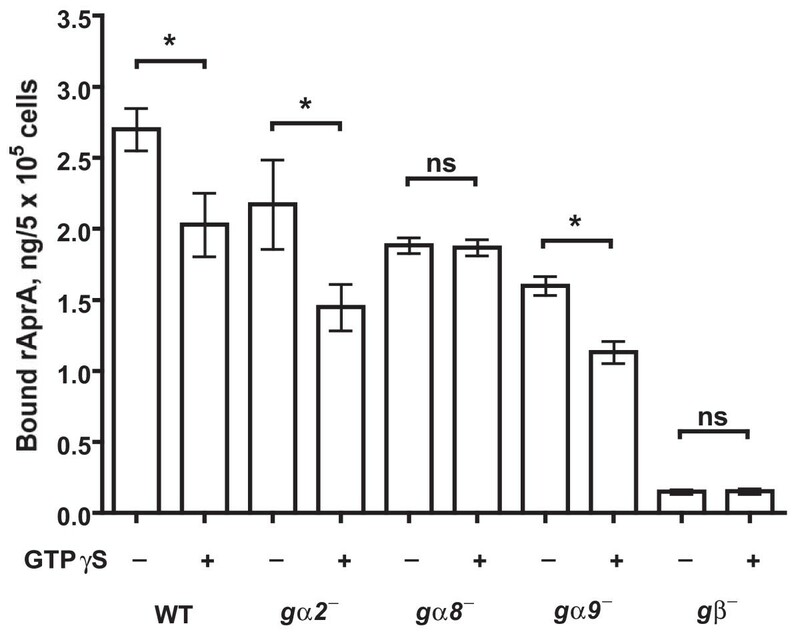 The latter observation suggests that Gα2 is not part of the AprA signal transduction pathway. One would predict that cells with low extracellular AprA and CfaD would cause rapid proliferation, so it appears that the loss of Gα2 has some deleterious effect on cell proliferation through a mechanism (possibly associated with accumulating less extracellular protein) that does not involve the AprA pathway. Although the gα5 mRNA was not detected in the vegetative cell RNA pool on a Northern blot of RNA from different developmental time points , the binding of rAprA to vegetative gα5 - cells showed cooperativity with a Hill coefficient of ~3, unlike the binding of rAprA to vegetative wild-type, gα8 - , gα9 - , and gβ - cells. This suggests that Gα5 is expressed in vegetative cells, and is somehow required for the normal function of the AprA receptor. A variety of indirect evidence has led to the hypothesis that some chalones act through G protein-mediated pathways . Our observation that the Dictyostelium chalone AprA uses a G protein-mediated signal transduction pathway involving Gα8 strongly supports this hypothesis, and suggests that therapeutics targeting chalone-activated G protein signal transduction pathways may be useful to regulate the proliferation of specific cell types. We thank William Loomis for the generous gift of Gα (3, 4, 5, 7, 8 and 9) and Gβ knockout cells, Gad Shaulsky for providing the gα2 - strain, and Darrell Pilling and Derrick Brazill for their helpful suggestions. This work was supported by NIH R01 GM074990. Growth curves, proliferation inhibition by rAprA, and rAprA binding assays were carried out by JMC and DB. DB did the AprA and CfaD in conditioned medium Western blots, mass and protein measurements, the GTP binding assays, the GTPγS assays, and the spore viability assays. Nuclei staining and counts were done by NEH. DB and RHG did the experimental design, statistical analysis, and wrote the manuscript. All authors read and approved the final manuscript.